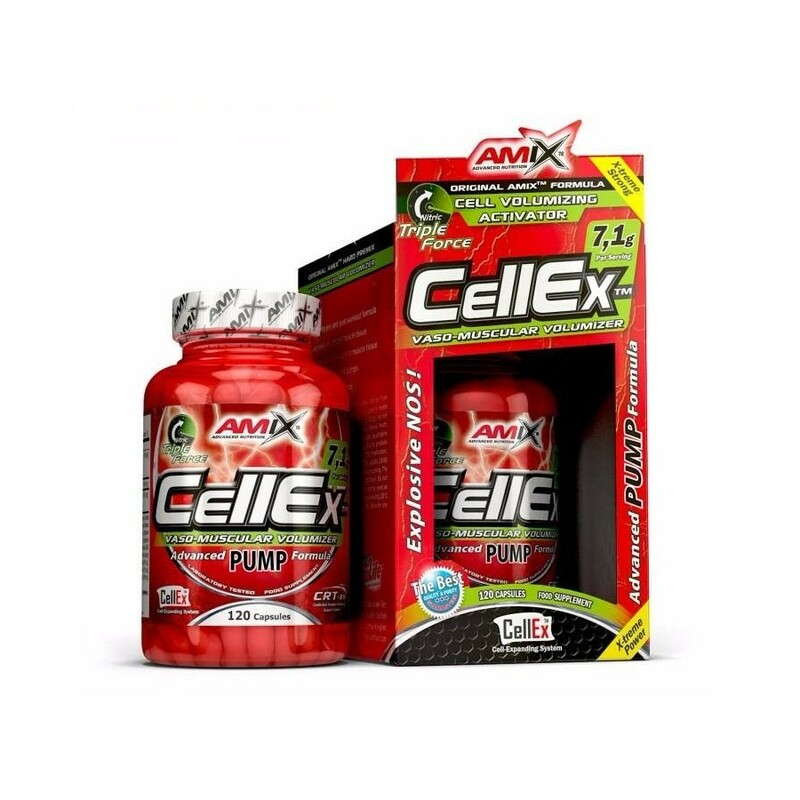 Cellex 120 capsules Amix is ​​a muscular volumizer macro glass that has been created with art products on the market with the best tech. To manufacture this product for sale in Nutricion24 it is a formula that increases rapidly the path of blood in the muscle tissue. This improves performance, increases the amount of energy the body. With this formula of pre and post exercise, the feeling of fatigue disappears during long sessions and lengthy training, which can increase performance allowing consecutively carry more weight in the sessions. 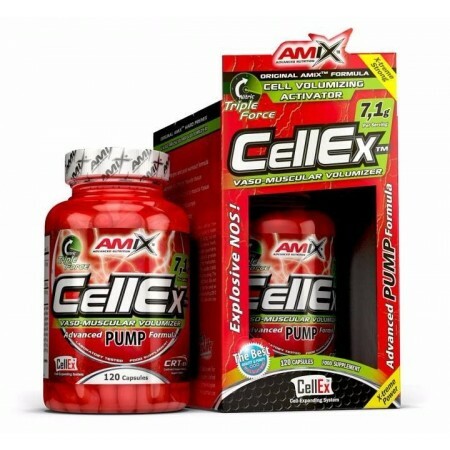 Cellex 120 capsules each containing a mixture of CVA (Cell Volumizing Activator), Arginine Matrix (triple nitric oxide) which increases strength, arterial vasodilation and congestion of muscles. This product you can buy at Amix Nutricion24 gives the agency an exclusive amount of activators of cell voluminizaión. Its components can be seen containing Tricreatine malate, Glucoronolactonas, L-Norvaline, Cinnulin PF (cinnamon extract), L-glutamine alpha-ketoglutarate (Glut-AKG), N-acetyl glutamine, L-tyrosine, Glycociamina and caffeine. This provides us a powerful volumizing effect, thanks to the synergistic action of all its components form. Athletes who take this supplement have a higher cardiovascular performance and faster recovery than usual is created after hard training sessions. The component that makes this possible is called L-citrulline malate. Cellex 120 capsules has among its ingredients Nitric Cellex formula Triple Force Compex is a formulation of nitric oxide generation, mixing ketogluterato arginine alpha (AAKG), the ethyl ester of L-arginine (HCL), and L Arginine alpha ketoisocaproate (A-AKIC). Also this product contains Nutricion24 sale technology CRT-ss (Controlled Release Technology Support System) which ensures a continuous supply of active substances to progressively along the muscle tissues day for total metabolization and optimum performance of the product. The main benefits of taking Cellex 120 capsules are the muscles receive more blood, muscle tissue and increases your blood flow; It also provides more nutrients to these tissues to the muscles increase in size from the first moment they start consuming this product from sale in Nutricion24; Athletes will see their energy rises and with it the physical performance; training after the recovery is faster so you will not miss time due to fatigue between coaching and training. As Cellex take 120 capsules: you must take a total of ten capsules a day, five fasting on rising five forty-five minutes before training.